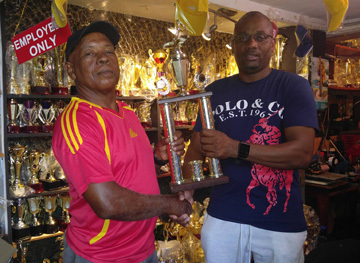 Brian Sealy (left) of Trophy Stall hands over the Winner’s Trophy to MSC Treasurer Troy Lewis at their Bourda Market location. Three trophies will be at stake for the Winners, Runners-Up and player of the final. Registration fee is $15,000 per team. Trophy Stall handed over the Championship Trophy to MSC Treasurer Troy Lewis at their Bourda Market location on Thursday. Lewis thanked Trophy Stall for their support and informed that the Event was the first fund raiser for 2019 and part proceeds with go towards funding of the all-weather practice facility presently under construction at the MSC Pavilion. MSC is encouraging sponsorship to construct two concreate and a turf pitches in an enclosed area for not only club members but any GCA player or team to use for a small fee. Herstelling Masters, Success Masters, Fisherman Masters, Ariel Masters will compete for the Trophy Stall Trophy. The ground which cut Thursday is in top condition and liquid refreshments will be on sale for fans.